One of my favorite grocery stores to visit is the Great Wall grocery in Falls Church, Virginia. Not only do they have great prices on all of the fresh produce, plus produce you won't find in your usual grocery (dragon fruit, mangosteen, bok choy), you can get any of the Asian specialties you like. They carry all the ramen - every brand, every flavor. Any kind of green tea you could imagine. Teriyaki flavored nori strips. If you've never been to a mega Asian grocery before it is an experience not to be missed. At the back of the store is a butcher's counter that runs the length of the store. Towards the right side - fresh shellfish. Towards the left - red meat. Around the middle, tanks and tanks of fish swimming around. That's right - you pick the fish in the tank you want, they plop it out, gut it, and kill it. 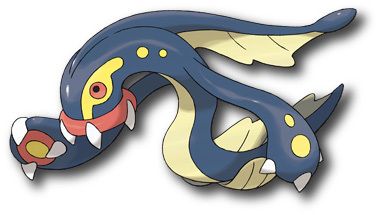 I've seen more than one Feebas meet its end that way. They used to have, but got in trouble for, a tank with eels. Those things are so grody. When I was growing up in Hawaii I was always told to have a healthy respect for the Moray Eels. Those monsters have two sets of jaws, literally in the same manner as the monster from the Alien movies. Let's be clear, here, eels are not my friends. They are not cool, they are not chill. I will let you know of one dude who is chill, though. You may mistake her for an eel - but I think you're wrong. This is my gal, and one of my favorite Pokémon, Eelektross. So let me tell you a story about being me. Specifically, me in March 0f 2011. If you think I'm a Pokémoron now, I was a Pokénoob then. Amazing, seeing as I had been playing Pokémon for about 11 years at that point, yet still. I like to think it is because I had never bought one of the "Official Pokédex" books before and wasn't familiar with Bulbapedia and other online resources. Can you believe I actually play Pokémon for the stories/adventure? Yes, people like me do exist! Anyways. There I was, in Chargestone Cave - wandering through, checking every nook and cranny. Who happened to pop out? Why the cutest little Pokémon ever - Tynamo. Wow! I didn't even ever want her to evolve. I named her TinyDynamo and just wanted to stick her in my pocket and carry her around with me forever. That's what I did! I tried to make her an essential part of my team but the thing about Tynamo is it doesn't learn any moves. We got to level 39, though, yeah, we made it! Tynamo evolved into Eelektrik! Ok, she's kind of ugly now, but we can make a move. I have a Thunderstone. Let me apply that immediately and, boom, Eelektross! Oh, wait, seriously? Eelektross, can't learn any moves by leveling up? Dag. That's right, the whole Eelektross family is designed to trick fools like me. We're like, evolve, evolve, you'll be stronger. Then you find out your boo will never learn Zap Cannon because you pushed her too hard. So the plain deal is Tynamo doesn't learn any moves by leveling up or TM/HM. You work hard to get that guy or gal up to level 39, evolve to Eelektrik. Eelektrik is where you need to hang. She can learn move after move by leveling up. Go for it! Then, when you're ready to drop in the power, expose that Thunderstone. Eelektross. Oh, poor TinyDynamo. I wanted her to be a scout, too! Her ability is Levitate, that is the only ability Eelektross can have. She carries a Dragon Fang (I don't have a Dragon Gem). So, here's how she is supposed to work on Team Tickles. She goes out paired up with Tickles. This ensures that Tickles will have the option to use Earthquake if necessary. If she sees a Dragon-type she smacks it with Dragon Tail to mess with the opponent's strategy. If she sees a Bug, Grass, Ice, Fire, Ground, or Rock-type, she uses Volt Switch to get herself out of there and swap in Hydreigon or Volcarona. If there's a Flying or Water-type she hits them with Thunder. If all else fails she goes in with a Crunch. Base stats indicate that Eelektross is an attacker, not a defender - with a slight edge towards physical (115 and 105). Defense and Special Defense are tied at 80, HP is 85, and Speed is 50. If you decide to make your Eelektross a physical attacker, go for a Lonely or Naughty nature. If you want the dude to be a Special Attacker, try Mild or Rash. If you'd like to select from both physical and special attacks, well, grab one of the non-modifying natures then, bro! Keep in mind that only Ground-type moves are super effective against Electric-types, so Eelektross has no weaknesses (with that Levitate ability). If you're doing it right maybe you don't need to worry about defense so much. I'd like to think a balanced outfitting of your Eelektross is probably wise - one physical, one special, one status, and one non-Electric-type. As a physical attack, why not Wild Charge. Yes, it has recoil, but it is difficult to find a physical Electric-type move! Special, try Discharge. Yes, Thunderbolt and Thunder have more power, but Discharge is still pretty powerful and a sure hit on everyone on the field (except Whiscash, dude's a Ground-type). I love Gastro Acid as a status move. Sure it doesn't work against weather teams but it can sure bungle a lot of other strategies out there. Finally, if you've tailored Eelektross to physical I like Crunch or Thrash, if she's a special attacker Flash Cannon will knock down your opponents Special Defense so you can follow up with some more painful Special Attacks. Probably the best hold item for Eelektross is a gem particular to the non-Electric-type move you are using. Get that one time STAB and use it right. In TCG, right now, Eelektross exists, but no one fully evolves a Tynamo. Eelektrik's Dynamotor is where it's at. Why is Eelektross so chill? Well, have a look at her. She's giving off a cool surfer-girl vibe riding the waves. I would argue, though, that sweet honey isn't riding water waves - she's riding electro-magnetic waves. I could easily see her hanging out with a young Kazran Sardick. Tynamo is found in a cave and I don't remember there being much water in Chargestone. Either way - check that Betty out and see if you can make her yours.